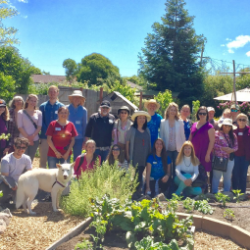 Sponsored by the Sonoma-Marin Saving Water Partnership, the annual Eco-Friendly Garden Tour is a self-guided tour showcasing water-wise landscapes across the county. But true to Daily Acts fashion we are putting a little homegrown twist on it. Daily Acts is offering special guided tours to several Rockin' Homesteads from 10am - 1pm running concurrently in Petaluma, Windsor, and Cotati. Envision rain tanks watering vegetable beds, greywater irrigating fruit trees, an understory of low water use insectary plants, a thick layer of water-retaining mulch on the old lawn area, beautiful rain gardens, and bees buzzing around the whole thing. There are some great examples around here of how fun and functional a water-wise garden can be. Sign up in the city of of your choice to experience first hand what other members of your community are growing right in their yards! Where: Directions will be attached to your registration confirmation email. If you do not get a confirmation email, you may need to try registering again or call our office at (707)789-9664.